When it comes to an all-terrain vehicle, you want the best the industry has to offer. One of the easiest ways to make the most of your model is to find a few great add-on components to up the function and fun. With our selection of Can Am ATV accessories at the ready, find everything you need with this intrepid brand of all-terrain vehicles. We offer one of the largest selections of Can Am ATV accessories on the market to ensure you get exactly what you need for your favorite wheels. With a focus on bringing you all the essentials and extras with ease and affordability, finding something new for your model has never been easier. We feature top brands known for their quality manufacturing for products you can choose with confidence with every purchase. 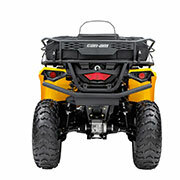 When looking at our inventory of Can Am ATV accessories, the first thing most people notice is the diversity of areas covered. Whether looking for foot pegs and traction plates or racks and holders, we have the items you need to make the most of every ride on your all-terrain vehicle. One of the easiest ways to up the function of your model is with an action camera. We offer several options and accessories to help you record the action with ease. When looking for audio solutions, we offer such essentials as audio cargo boxes and handlebar soundbars, to help you get the best in audio while out and about on your ATV. When you need items to add extra function to your vehicle, check out the options such as track systems, GPS systems, slip-on exhausts, and more. The matter of safety can never be overlooked which is why we also offer a range of safety-related accessories to keep you safe while riding. Whether looking for something just for fun or something for function, we have you covered with our Can Am ATV accessories. Find it all today! Please contact us with any questions. We are happy to assist you further in your search for the right solution for your vehicle.